Labour has held onto the Glasgow Cathcart seat in the Scottish Parliament but with a reduced majority of 2,405. Voters in Cathcart elected former Glasgow City Council leader Charlie Gordon as their new MSP. The seat became vacant after the resignation of Mike Watson, who later was sentenced to 16 months in jail for wilful fire-raising. Turnout was 31.97%, the lowest ever at a by-election in Scotland. In his victory speech, Mr Gordon said: "I want to thank the people of Cathcart constituency for sticking with the Labour Party in difficult circumstances and for giving me the chance to serve them in the Scottish Parliament. "That work starts tomorrow morning, but tonight we celebrate a hard fought Labour victory." There was a 3.7% swing to the Scottish National Party, which increased its share of the vote by 6%. Labour's share fell by 2%. The SNP candidate, Maire Whitehead, said that the result would give little comfort to the Labour Party. "The people of Cathcart and Scotland have had enough of broken promises," she said. "We have had enough of a Labour prime minister who sends troops to an illegal war in Iraq and then stabs them in the back." She went on to accuse Labour of lying about the war in Iraq and "cheating" Scotland out of 30 years of oil wealth. Scottish Conservative leader David McLetchie expressed delight at the increase in his party's Cathcart vote, which went up from just under 13% in 2003 to 15%. He said it reflected an excellent campaign and a well-respected candidate. Mr Gordon stated his intention to seek election to the Scottish Parliament when his stepped down as Glasgow City Council leader earlier this year. The 53-year-old said he felt his knowledge and experience could be deployed to Glasgow's advantage. In the Scottish Parliament elections in May 2003, turnout was 45.3% but this slumped to just under 32% at the by-election. Commenting on the fall, Sir Neil Mackintosh, of the Electoral Commission, said: "Cathcart is not an area associated with apathy. "It's not an area associated with people not taking an interest in their local community and from that point of view it's intensely worrying that we got such a low turnout in a by-election. "I think it's another sign of a malaise in our society." 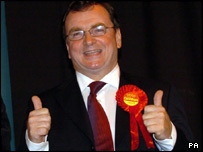 In 2003, Mike Watson was re-elected to represent Cathcart with a majority of 5,112. He spent the first couple of years in the Scottish Parliament on the backbenches where he helped bring about legislation to abolish fox hunting in Scotland. First Minister Jack McConnell then gave him a position in his Cabinet as minister for tourism, culture and sport. However, he attracted controversy when he appeared to favour campaigners in his own constituency who were attempting to overturn the Scottish Executive's policy on hospitals in Glasgow. He was dropped in 2003 and returned to the backbench. As a Westminster seat, Glasgow Cathcart was originally a strong Conservative area. But their majority reduced over the years and populist Conservative Teddy Taylor, who held the seat from 1964 until 1979, eventually lost out to Labour. 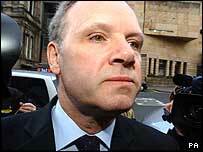 In 1999, Mike Watson won the constituency's Holyrood seat with a 20.1% majority over the SNP and was re-elected in 2003. Low turnout: Is apathy winning?